The acrylic conformal coating is expected to lead the ****** conformal coating material market during the forecast period. This is owing to the fact that among all the materials it is the easiest to re-work on the acrylic material. Besides this, acrylic material is also easy to apply, has low cost, takes less time to cure, and provides good resistance from chemical, moisture, and abrasion. The automotive electronics application segment is expected to hold the largest share in the ****** conformal coating material market during the forecast period. Automotive manufacturers are working hard towards offering products of higher quality and reliability at a competitive price. The electronics in the automobile are usually placed in the areas where they are subjected to harsh working conditions, chemical, moisture, dust, and vibration. These factors necessitate the use of conformal coating on automotive electronics so that a protective layer can be added on electronic components to protect them. This research report categorizes the ****** electronics conformal coating market based on materials, equipment, methods, applications, and regions. 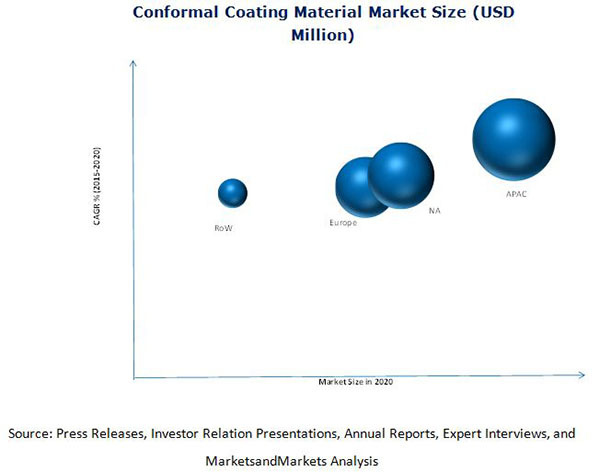 This report describes the drivers, restraints, opportunities, and challenges for the growth of the conformal coating market. The Porter’s Five Forces analysis has been included in the report with a description of each of its force and their respective impact on the conformal coating market.